Bucky Barnes just wants to help people get their lives back on track, but you can only go so far to save people if they aren’t willing to follow your lead. The Winter Soldier miniseries from writer Kyle Higgins, artist Rod Reis, and letterer Clayton Cowles has been a remarkable exploration of Bucky’s lasting trauma after decades as a mind-controlled assassin, which motivates him to make up for the sins of his past by assisting people who are trying to escape a life of crime. He sees a mirror of himself in RJ, a teenage boy tormented by Hydra in order to become a vicious killer, and Bucky takes him under his wing in hopes of setting him on a new life path. That mentorship is interrupted by the arrival of RJ’s father, though, and when Bucky confronts the man about his shady plans for his son, a fight breaks out that ends with the father flying into a dumpster and snapping his neck on the rim. 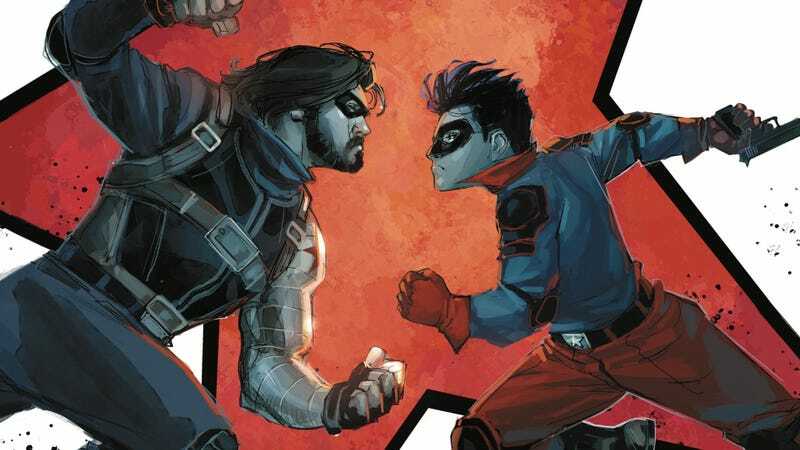 It puts Bucky in a complicated position, and the conclusion of this miniseries has him trying to figure out how to break this news to RJ without sending him backsliding into a life of vengeful villainy. This exclusive preview of next week’s Winter Soldier #5 begins with RJ waiting for his father to meet him for breakfast, building the tension by reinforcing personal stakes before the action jumps to Bucky and Sharon Carter dealing with the dead body. The page of the corpse in the trunk with the buzzing cell phone is a great example of how well Reis intensifies the emotional content of the script as he illuminates the man’s blank face with his son’s messages, and Higgins is fully aware of this skill after working with Reis on creator-owned projects like C.O.W.L. and Hadrian’s Wall. The final panel of this excerpt highlights the weight of Bucky’s violent past through layout and color, cutting through the close-up shot of his face to reveal how these murders haunt his conscience. Higgins has given his collaborator a lot of juicy sequences to draw and color—Bucky and RJ’s fight against The Spot in issue #3 is particularly notable for its bold graphic elements—and their creative rapport has brought significant depth to this series as they find fresh ways to depict Bucky’s internal and external conflicts.